This is not the official website for Veterans Memorial, but rather an informative guide on NELSAP. Please view the official site for more updated information. Veteran's Memorial Ski Area is a classic family ski area located on Flaghole Road in Franklin, NH. 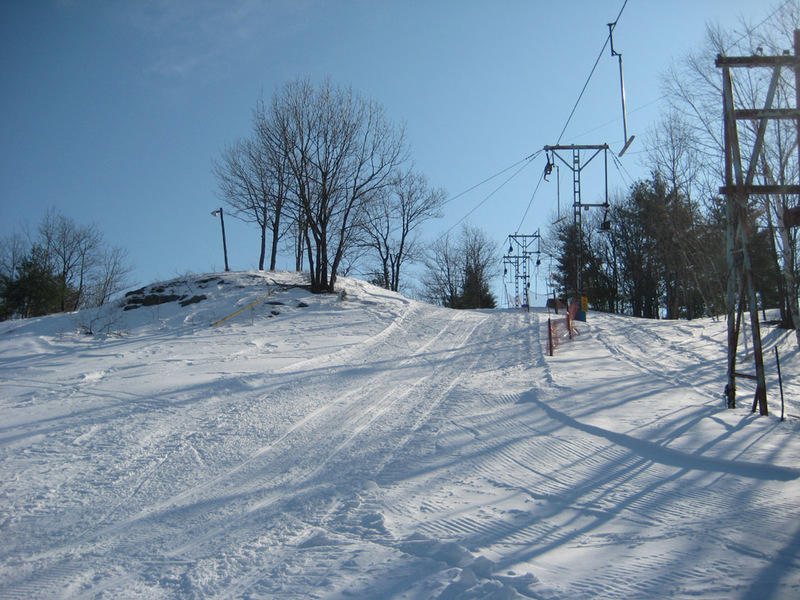 The ski area offers several trails and slopes for all abilities on a 220' vertical drop. 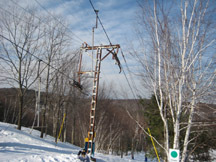 One rope tow and one T-bar provide access to the mountain. There is no snowmaking, so the skiing is all natural. 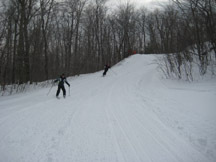 Night skiing is available only during their Winter Carnival. 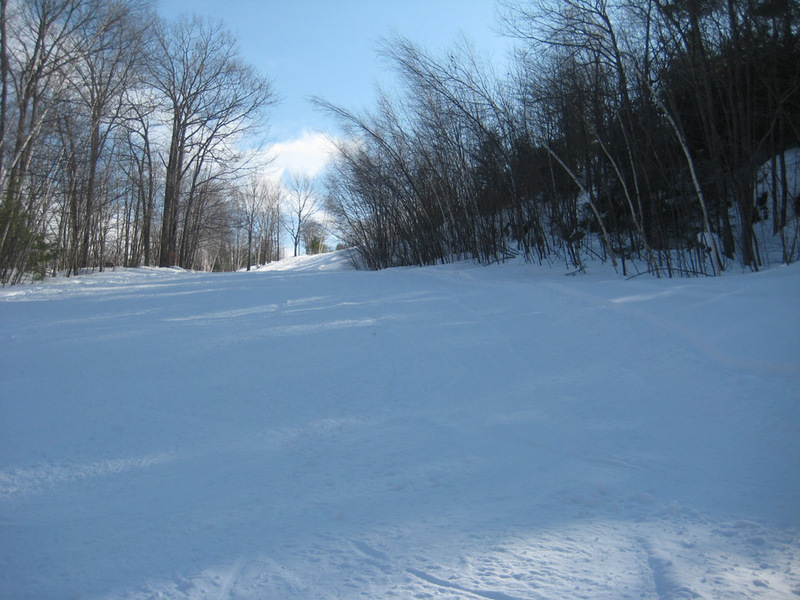 It is truly a wonderful ski area that is extremely affordable and has classic terrain. 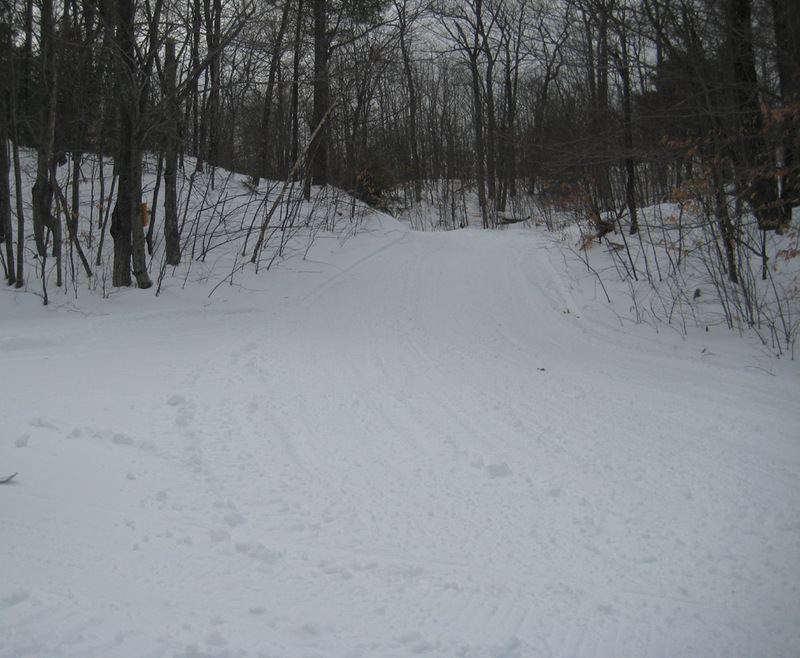 (Right - the trail map for the ski area. Click on it for the larger version). 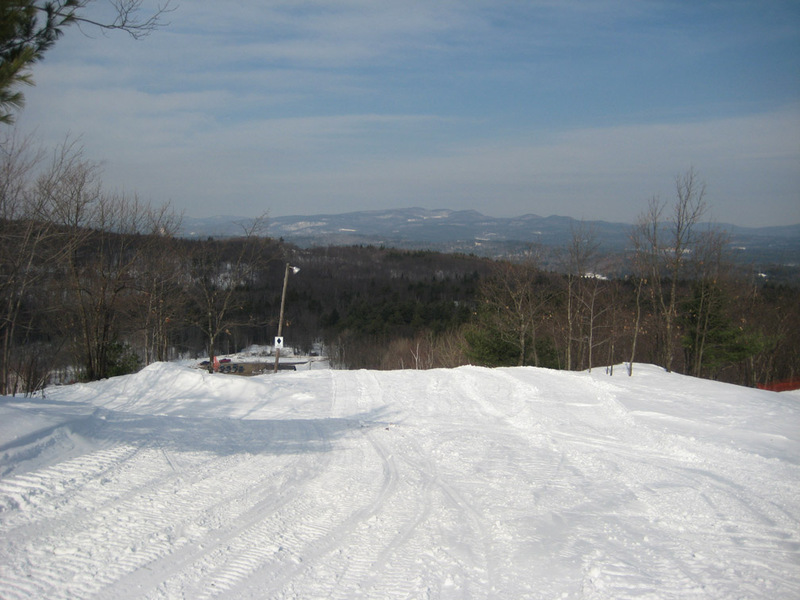 The Franklin Outing Club originally operated Sunny Slopes in next door Andover. 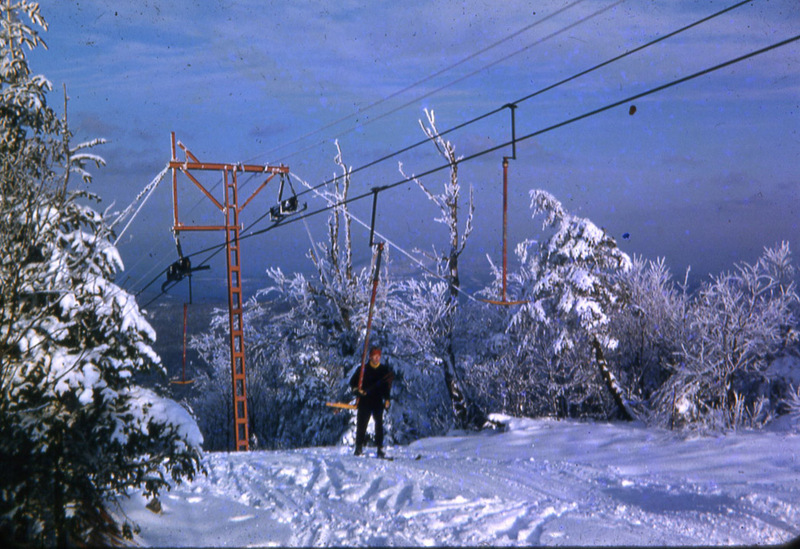 That ski area was discontinued in the 1950's due to its south exposure. It is believed that the original club disbanded at that time. 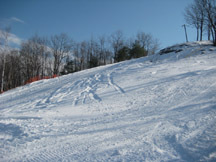 In January of 1960, the Franklin Recreation Department was authorized to create a ski area on the site of the Great Gains Forest. This was land that was donated to the town in the 1930's by Dr. Ervin Drake, who wanted to supply less fortunate town residents with a place to obtain firewood. 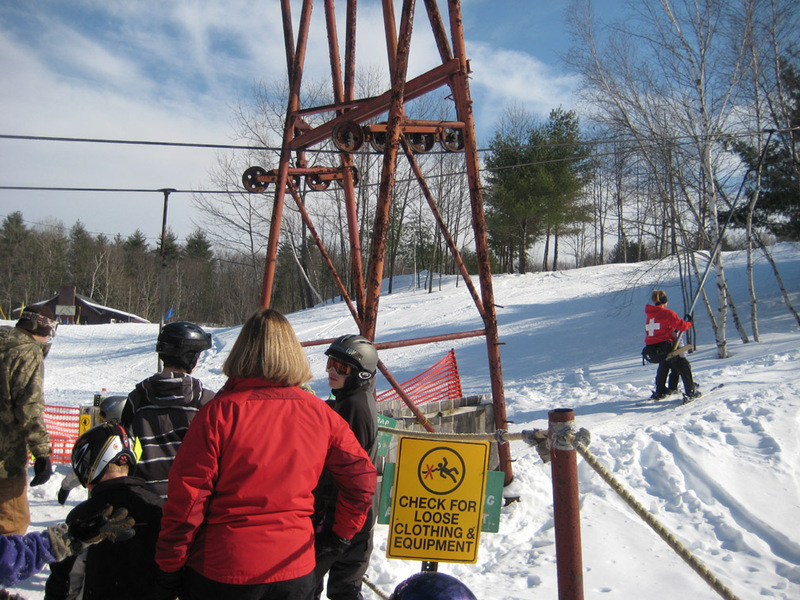 In January of 1961, the Franklin Outing Club was reconstituted to help the Recreation Department run the ski area. 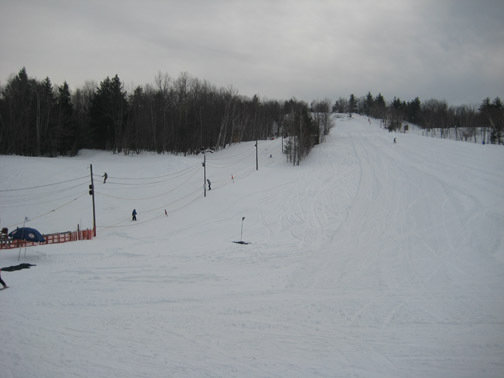 Finally, in March of 1962 the Great Gains Ski Area (the original name of Veteran's Memorial) opened with a rope tow, and hosted its first Winter Carnival. 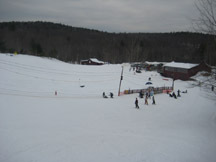 (Left - a view of the ski area from the deck of the lodge. The rope tow is on the left, and the T-bar on the far right. Several trails are not visible. Click on the photo for the larger version). A Veterans Memorial Fund had been set up previously to honor those who had given their lives during World War II and Korea. The decision was made by the City Council to create a more living memorial by investing $4,000 of this fund to build a lodge at the ski area in April of 1962. 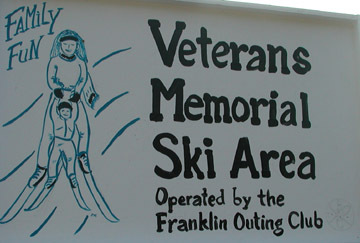 The area was renamed the Franklin Veterans Memorial Ski Area at that time. The lodge was dedicated in January of 1964 with a bronze plaque honoring veterans sacrifices above the fireplace. It has been updated with those who have given their lives for this country ever since. At some point in the late 1960's, a used Heron T-bar from the Sun Bowl at Mt. Sunapee was purchased, as that T-bar had been upgraded to a double chair. The lift was shortened and installed to the top of Veterans Memorial. 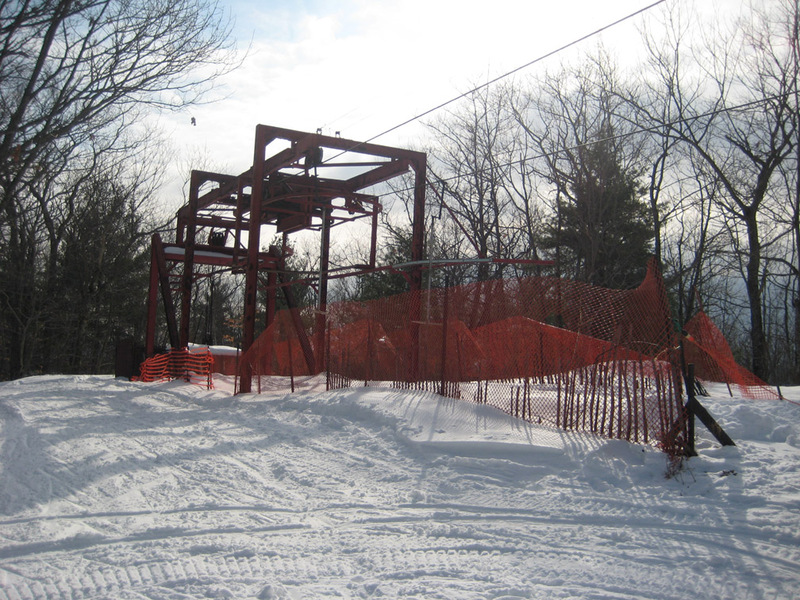 The lift originally was installed at Sunapee at some point in the early 1950's, which makes it one of the oldest overhead cable surface lifts still operating in New England (the oldest is the J-bar at Black Mountain in NH). This video was taken in February, 2009 at the base of the T-bar. Over the 1970's and into the 2000's, a few new trails were created along the periphery of the mountain, giving the area approximately 10 trails and slopes. The ski area skis much bigger than its 200' of vertical suggests, as a majority of these trails weave through the forest at the edges of the ski area. 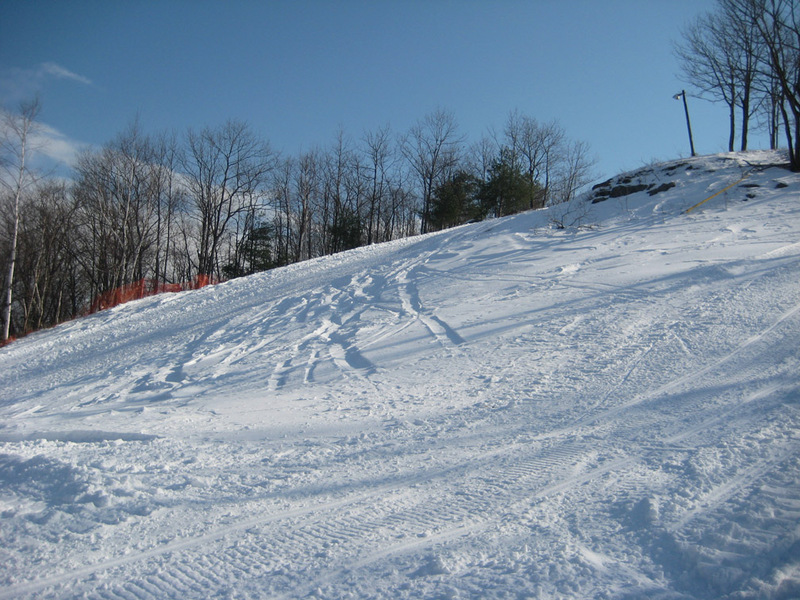 (Right - the top of the Chute Slope, which also shows the T-bar. Click on it for the larger version). 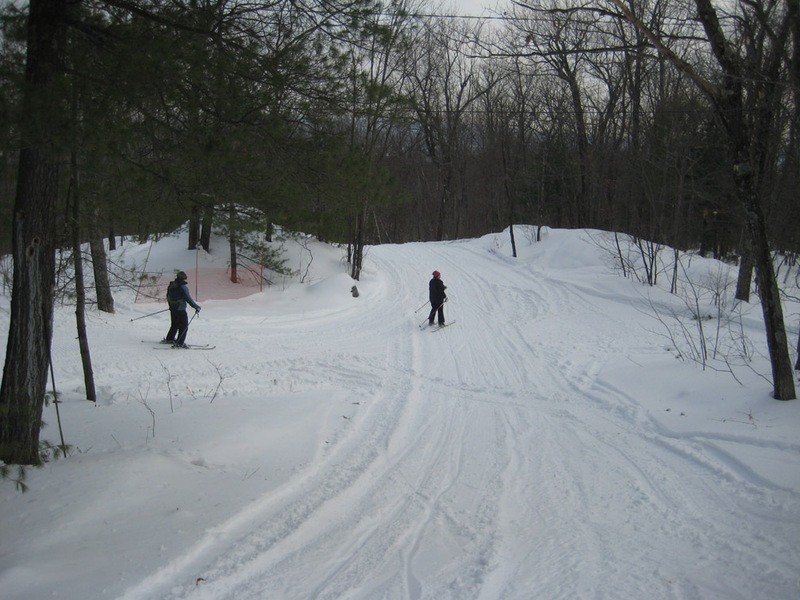 On February 7th, 2009, we had the chance to ski at Veterans Memorial. What a great day! The volunteers at the ski area were most helpful showing us around and telling us its history. By the end of the day we had met all the volunteers - how often does that happen? Kathy Fuller, the Treasurer and pictured on the left, gave us a full guided tour of the mountain, and was most helpful. 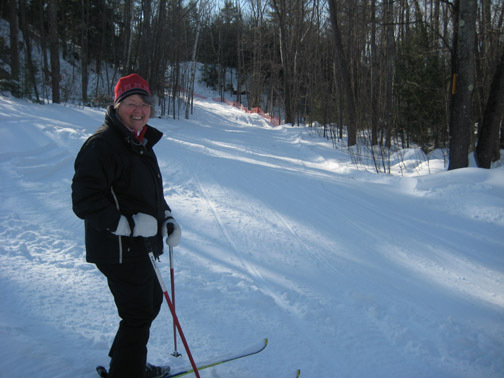 Her father had helped build the ski area back in the early 1960's. 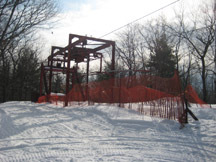 I strongly recommended that all ski history enthusiasts check out this classic ski area. 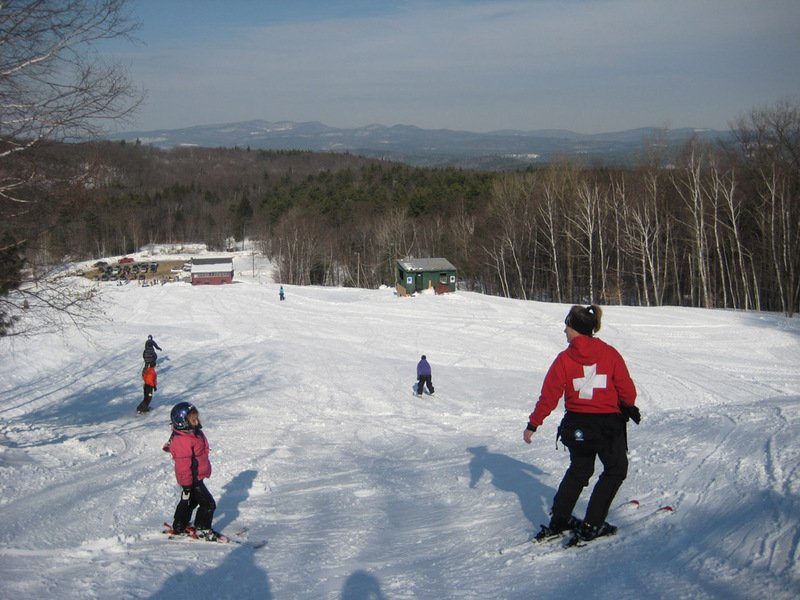 Its perfect for families, but anybody who enjoys an old-time ski experience will enjoy it. Lift tickets are just a fraction of the cost of other larger ski areas. If you go, tell them you heard about it on NELSAP! Kathy Fuller: In 1961 my Dad and others formed a new rejuvenated Franklin Outing Club and established the Veteran's Memorial Recreation Area in Franklin on city land. The club continues today operating this all volunteer area much like the areas of yesterday. 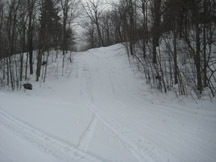 "Veteran's Memorial Ski Area- a little hill in Franklin, probably no more than 200 vertical. 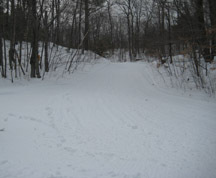 It had one T-bar up the right side, with a main slope and smaller "expert" trail down the skier's right. I wound up there on a whim one day around 1987, never able to find it again. No snowmaking, no grooming I don't think. 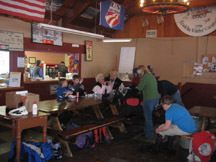 Had a quaint red base lodge, with old vets sitting down and ski nostalgia on the walls. It holds a special place in my memory." Meddia Perry: Veterans Memorial - I have not skied here since 1988, but I am sure that it is actually still open. 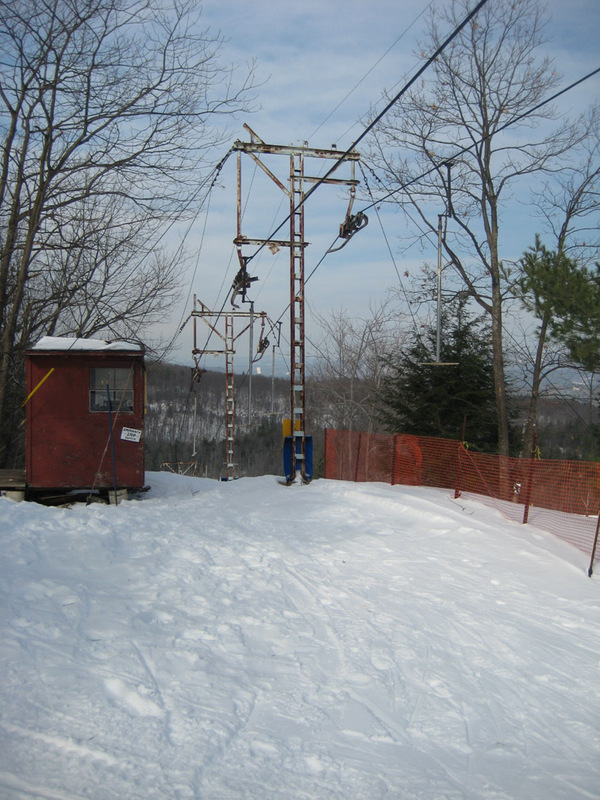 The ski lifts show up on the USGS maps (400' of vertical) and the area can be reached from Route 11 in downtown West Franklin - take a left onto Chance Pond road at the Sunoco station, then after a mile, take another left onto Flaghole Road and the ski area is about two miles up the hill. Wendy K Beaudet (2002): There is a T-bar to the summit and a beginners rope tow. 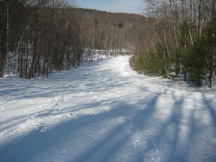 There is one main slope, and several narrow trails through the woods. There even used to be night skiing, although I think they have stopped running the lights lately. I grew up skiing at Veteran's Memorial here in Franklin, NH. I am a 3rd generation, my kids now 4th. My name is Wendy K. Beaudet and the area was created in 1961 (I will have to ask my mom to be absolutely sure.) by a group of young families who founded the Franklin Outing Club. The city of Franklin had set aside funds for a memorial for the Veterans of WWI and WWII and they had this hill/mountain of land called the Great Gains Forest. My grandfather, Ted Gilchrist, along with other WWII vets with young families worked to cut trails, acquire ski lifts and build a ski lodge. Their mission was to provide affordable skiing to the families of Franklin. 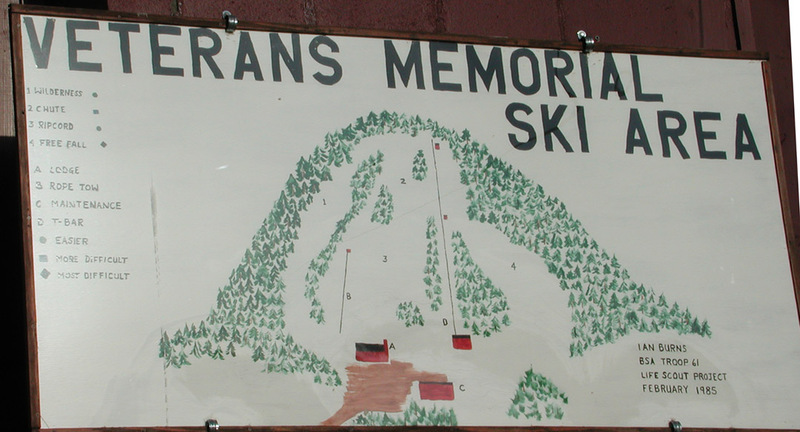 The ski area was dedicated to the memory of the veterans of the wars - hence it's name of Veteran's Memorial Recreation Area. While the ski area retains the simplicity of the 60's - we still have a rope tow and a T-bar, and we operate without snowmaking - the area boasts a ski patrol, trail grooming, a skating pond, free ski lessons on Saturday mornings - and an annual winter carnival with ski races, pancake breakfast, casserole supper, torch-light parade, fishing derby, a snow-golf tournament, skating parties, etc. Every year there are specially designed buttons made to sell and advertising booklets created to pass out to the community - all profits going to support the ski area. This year is our 40th Winter Carnival! 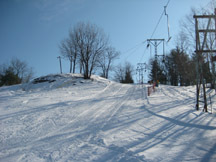 The area, with the exception of paid lift attendants, continues to be completely volunteer run by the Franklin Outing Club. Volunteers man the concession stand of the lodge, give ski lessons, ski patrol, groom the trails, work on the upkeep of the lifts. It truly is a living memorial to all those who fought for our country - and especially poignant this year - those who still continue to fight for our freedom. The ski area is open on weekends when there is good snow coverage - 10am to 4pm. It is also open on school vacations. 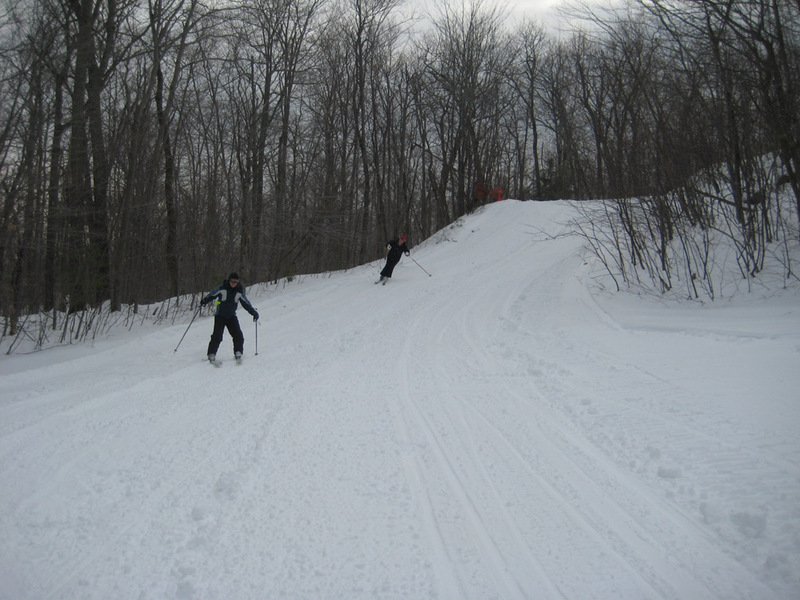 Night skiing generally occurs 1 or 2 times during the Winter Carnival. It is a wonderful little area that so many kids and families have grown up skiing at. If you would like more historical information - please let me know and I can get that for you. It was neat to read about VMRA's entry on your web site! Thank you! 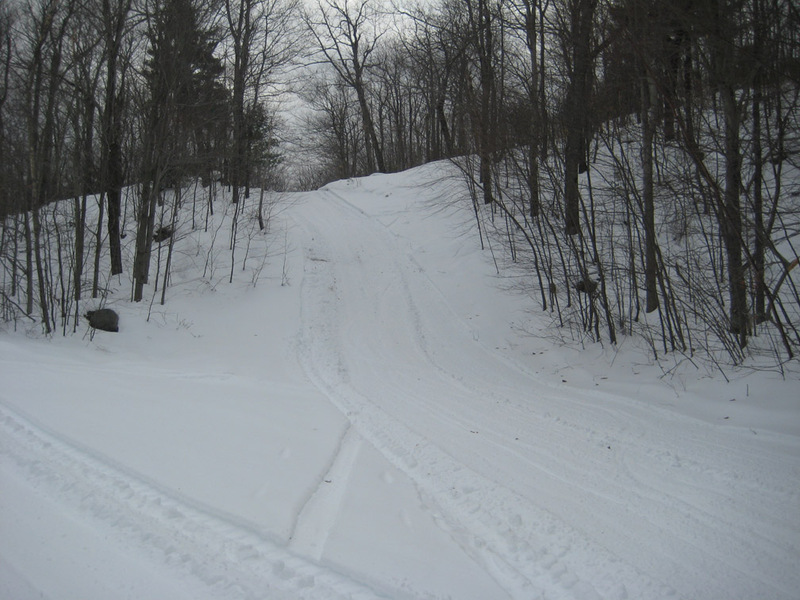 Michael Cooper, National Ski Patroller for the Veterans Memorial Ski Area (2002): In recent years, the ski area has added two new trails and has re-built the engine to its rope tow. 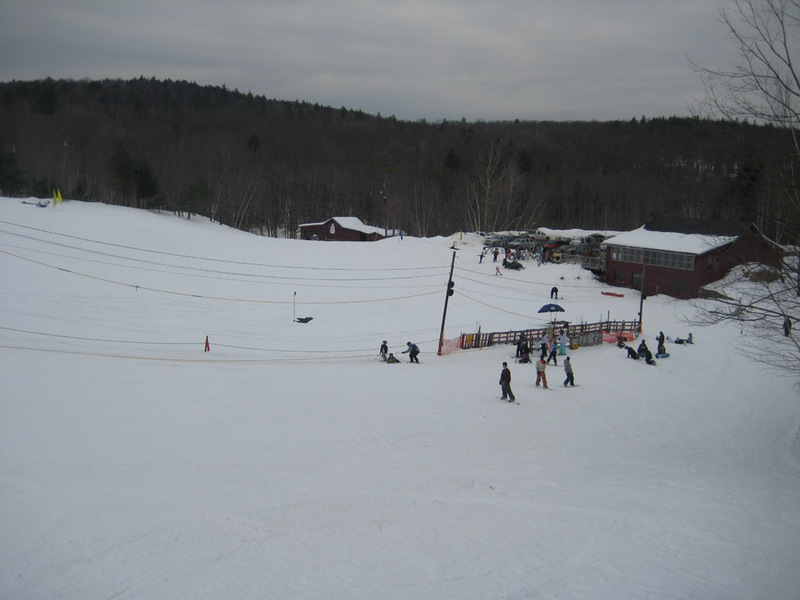 While the ski area is no longer open on Thursday nights for night skiing, the area does open two nights a year as part of the Franklin Outing Club's winter carnival. Nathan Hersom (2000): It is run by a group of volunteers and is real popular with the Franklin kids. The T-bar is 1000 ft. in length and was brought over from Mt. Sunapee in the mid sixties. Prior to that there was a rope tow. 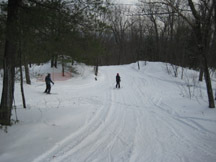 There is also a skating pond and other nice areas for other winter pursuits. It is patrolled by the national ski patrol (again all local volunteers). 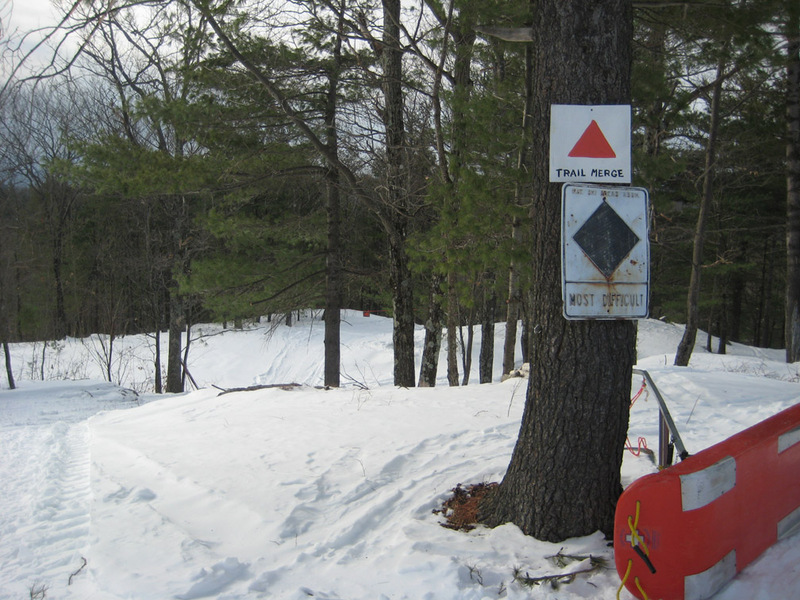 Although small, quiet, and well hidden VMRA is alive, well, and provides the youth of Franklin outdoor winter sports at a fraction of the cost. Please click on each of these photos to view the larger version. 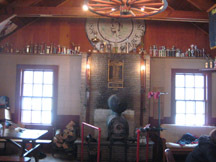 The inside of the lodge features a cozy space by the wood stove. A memorial to Veterans hangs proudly above the fireplace. Note all the trophies as well! 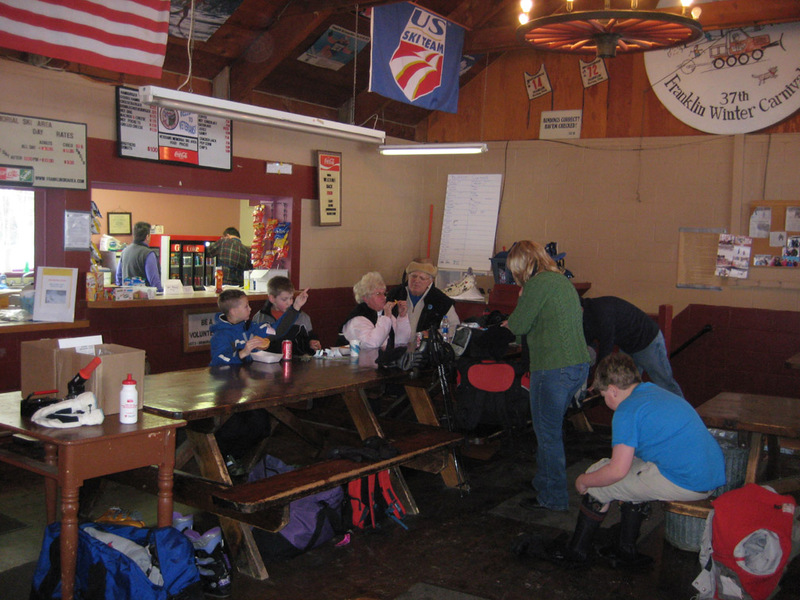 The snack bar serves hungry skiers - very affordable prices! This rope serves an easy beginner slope, as well as the lower portions of the Ripcord slope. 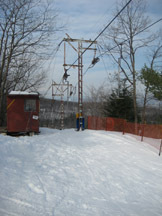 Base of the T-bar, very short lift line. Taken from the midstation, this is the lower portion of the T-bar. A view from the midstation to the summit of the ski area. Unloading ramp for the top of the T-bar. Return station for the lift. 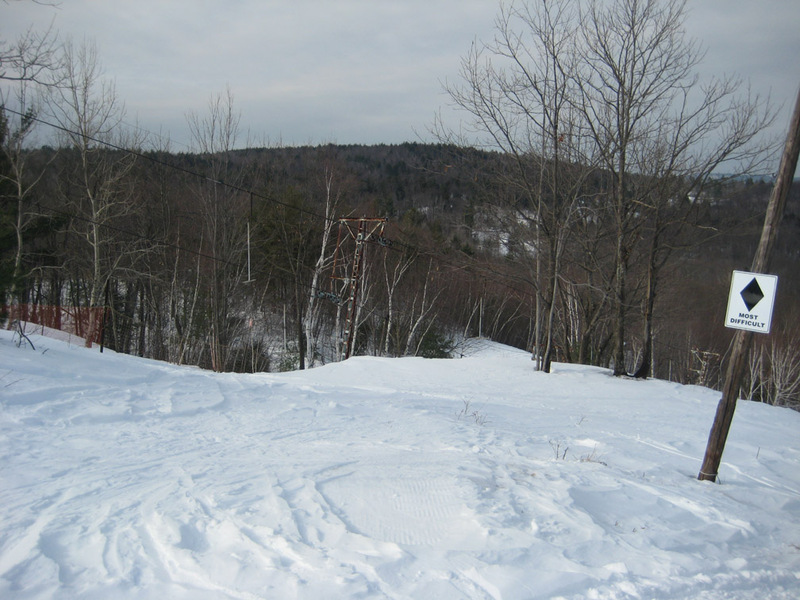 Freefall is a relatively narrow, twisty trail in the west side of the mountain. It begins at the summit and ends at the T-bar. It starts off expert but ends intermediate. There is also a smaller side trail off of Freefall. Here is the beginning of the trail. And its conclusion. Chute is a fairly steep, but short open slope from the summit to halfway down the hill. It starts off mellow, as shown here, with good views. But ends with a quick, steep drop. There is also another short trail that does a short loop, you can just make it out near the orange fence in the background. 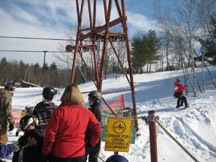 The Ripcord Slope begins at the end of Chute, and ends at the base lodge. Its an easy, wide open slope. You can also start Ripcord from the midstation. 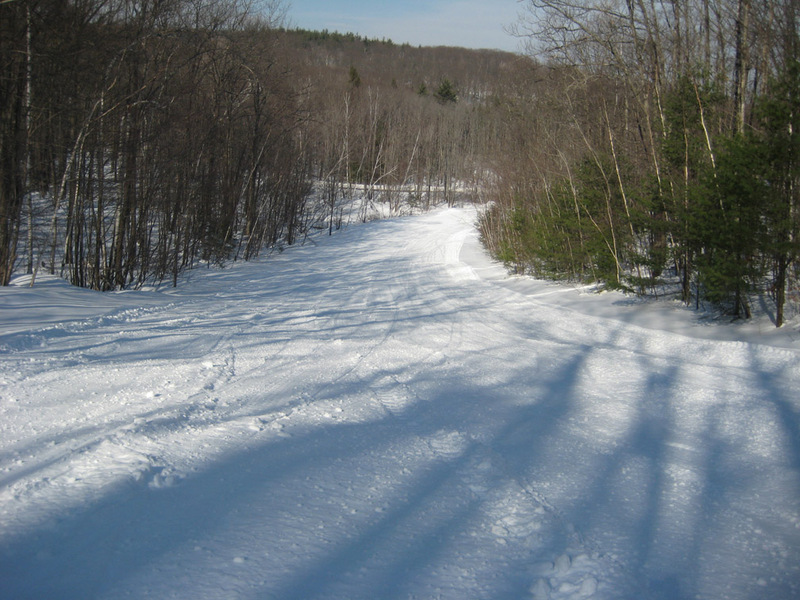 Wilderness Trail begins at the top, and is a low intermediate, twisting trail along the east side of the mountain, that skis bigger than its 200' of vertical. Here is the beginning of the trail. And a sharp curve 1/3 of the way down. Two other short trails come off of Wilderness near the top and meet up with the trail about halfway. These are not long but do have quick drops. Here is one. And the other. If you have a memory or photo to share, just let us know.